Atleti left the Ramon Sanchez Pizjuan with full points after a disappointing game which was tetchy, lacked any real flow and neither side was able to provide the quality required to make the difference until Raul Garcia’s shot was flicked home in the 75th minute. With no Gary Medel to anchor the midfield, Emery went with Kondogbia and Rakitic as the double pivot and Reyes as the central point in the attacking trident behind Negredo. It never really worked with Reyes having a limited impact upon the game. 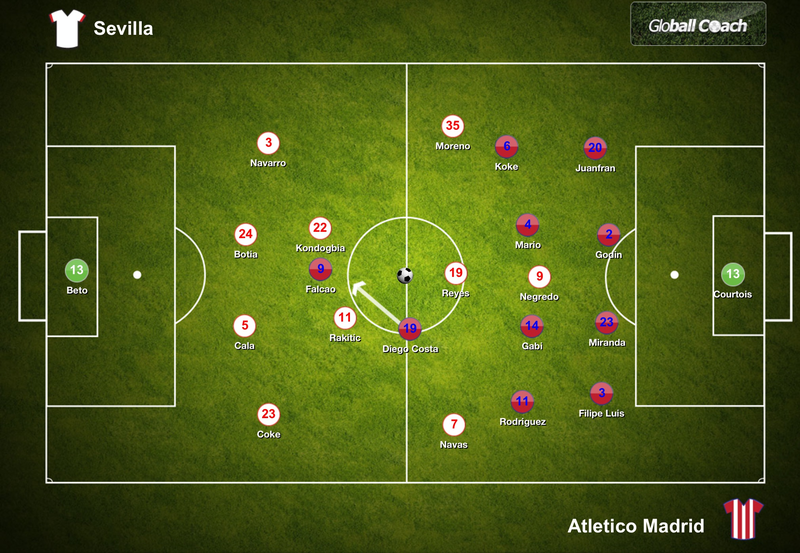 Simone opted for a 4-4-1-1 formation with Diego Costs supporting Falcao in attack. It was very familiar from Atleti. Maintain shape and control space whilst waiting to exploit Sevilla on the transitions. As stated earlier, this game never really developed any real flow. There were a number of petulant fouls conceded and many further incidents of players going to ground easily trying to win free kicks etc. There were 30 fouls in the game and 6 cautions with 5 of these going to the away side. Despite the nature of the game, Sevilla only collected a solitary caution, surprising given their extremely poor disciplinary record in the league this season that has seen them collect 12 red cards already. Suspensions have cost them dearly this season. Whilst many players become infuriated by a disrupted game, unable to develop any rhythm, there are those players who thrive in such circumstances and only add to the situation through their own calculated behaviour. Diego Costa is one such individual. Diego Costa has earned quite a reputation this season to the extent that the LFP have offered to provide him with anger management classes, seemingly in an effort to curb the worst excesses of this behaviour. Somewhere along the way, everyone seems to have overlooked the quality that Costa can offer the team and also the small issue that Costa may actually enjoy performing such a role on the pitch. Why? It works. The Brazilian, who has recently received his first two caps for his country, possess that rare quality. The ability to infuriate opponents through his demeanor, attitude and general play acting which often overlooks his quality. Costa has weighed in with seven goals and six assists in the league so far this season but his caution count is more impressive standing at 10. Against Sevilla he was fairly quiet in terms of his quality committing one foul and being fouled twice. He completed 9 passes from 12 attempted and managed just a single shot at goal which was off target. Yet he was still the focus with his play acting after he and Navarro went head to head in the second half. Some may say that Costa has to eradicate these unsavoury elements from his game if he is to reach the next level but there is most definitely a case to be made that those same elements are what makes Diego Costa so successful in the first place. Much of what happened could have been easily predicted before the start. Sevilla controlled possession with 62% as Atleti dropped into their usual format away from home, retaining their shape and allowing the opposition to come forward. Sevilla completed 468 passes from 576 attempted but the pass statistics from Atleti are surprising. Despite having just 38%, Atleti only made 134 successful passes form 194 attempted. The men from Madrid were very direct, going long as soon as possible. Simone is an advocate of doing something with the ball when you have it but this is still an extremely direct approach to take. Yet Simeone would not have been concerned. For the first 75 minutes despite having so much possession, Sevilla could only manage seven attempts at goal with just one shot on target. The side were lacking in the final third with no real ideas and Negredo, in the first half especially, not linking with the rest of the team. The frontman made just three successful passes in the first half. He lacked mobility. The home side managed a further six shots at goal in the final 15 minutes as Atleti fell deeper to protect their slim advantage but just two shots were on target. Courtois was never placed in any real difficulties. The poor forward play was also visible on the Atleti side too as the visitors had one shot on target in the entire game and scored. The problem for Sevilla was in originating in the midfield are. With Medel missing and Maduro on the bench, Emery went with Kondogbia as the deepest midfielder alongside Rakitic who could move higher. The problem was that this removed Rakitic’s passing from the final third and Reyes simply offered too little in an attacking sense. Sevilla needed Rakitic higher up the pitch and could have removed Reyes fro Maduro earlier, allowing Kondogbia to become more of a box to box midfielder. This trio may have been more effective. Yet compare Rakitic against the Atleti central duo of Gabi and Mario. 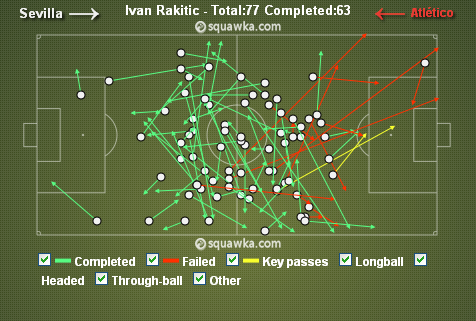 The duo completed 42 passes form 48 attempted, considerably less than Rakitic did on his own. Creation is not their role though. They are there to shield the back four. To always be in position. Gabi and Mario made 5 successful tackles from 6 attempted and completed 5 interceptions. Their job is primarily destructive and provides the platform for the team to play and they are highly effective at their occupation within the Atleti set up. The possibility of a European place for Sevilla was always a long shot but it’s now almost certainly over. Their away form is very poor and they had to secure maximum points from their home games if they were to have any hope of clinching a place. Atleti now have the ideal opportunity to move into second place in the league and end a horrendous run of form stretching back to last century against their cross city rivals when they host Madrid at the Calderon on Saturday evening. Just three points separates the sides but Madrid must contend with a Champions League semi final either side of the derby.